Welcome to my project for the "It's A Girl Thing" Turner Syndrome Awareness Inaugural Blog Hop. 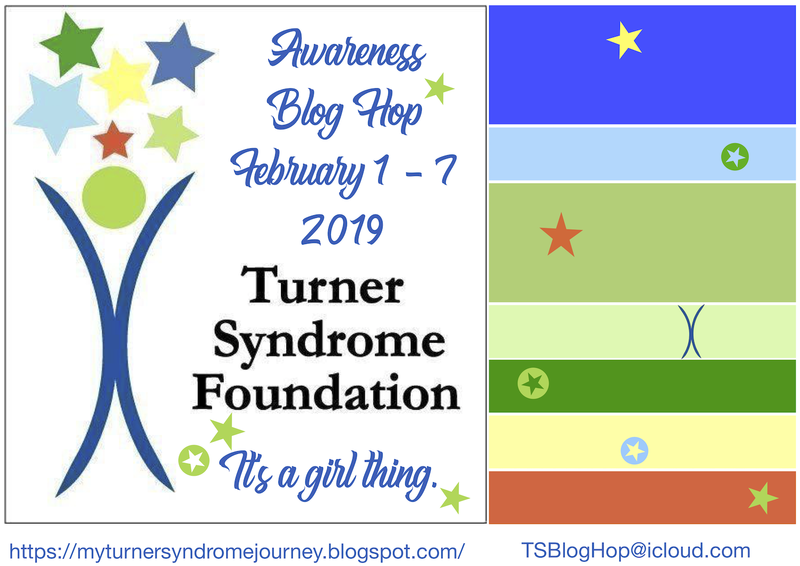 Turner Syndrome is a genetic disorder where a female is born with only one X chromosome, instead of two, leaving her with life-long medical issues and learning disabilities. This condition occurs one in 2,500 female births worldwide, but is more common among pregnancies that do not survive to full term. That is why Turner Syndrome Females are considered MIRACLES. My project was pretty easy to create using various digital images and digital paper. 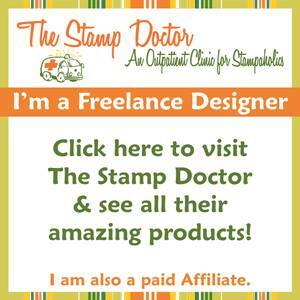 The focal point is a new digital stamp set created by my friend Donna Ellis. (You can find it here.) To give it added dimension, I resized and printed the butterfly a couple different times and fussy cut these out. I added Nuvo glitter (Turquoise) to the outlines of each of the butterflies and folded the wings of the smaller ones upward. I also added a couple lines of double sided tape along the bottom of the second layer of blue matting and covered it with more Turquoise glitter. The sentiment is also a digital image created by Donna for the participants of this blog hop as a "thank you for participating" gift. I changed the color to coordinate with the colors from the official TS color board. The digital paper is one that I've had for a long time and unfortunately, I don't remember who the manufacturer was. The card base was created from a piece of glossy photo paper. I wanted to see if you could do some of the same types of techniques on the photo paper as you could on regular glossy paper. For this one, I spritzed several different colors of Nuvo Shimmer Powders onto the photo paper and spritzed it with water. I allowed each layer of color to dry before adding more colors. I kept doing this until I was happy with the results. It was so much fun, that I created a whole batch of backgrounds for future use. 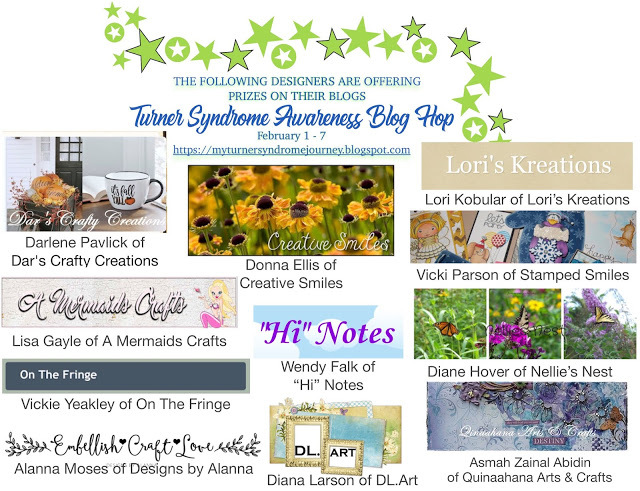 Now it's time to head back to the "It's A Girl Thing" Turner Syndrome Awareness Inaugural Blog Hop page. Check the "How to Win" section to see the requirements needed to be eligible for prizes. You'll also find who the next person on the blog hop is. 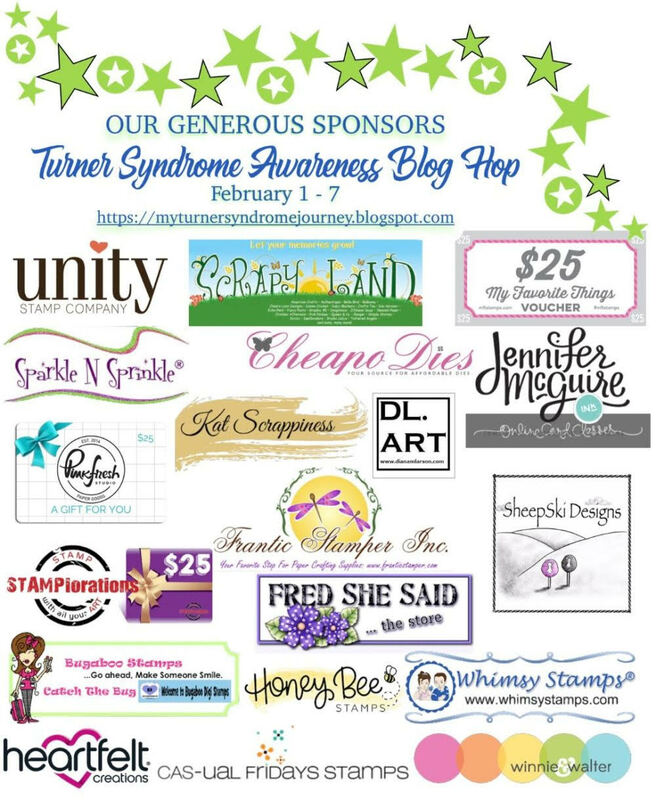 Thanks again for joining us and learning more about Turner Syndrome. Anne ~ Thank you so much for being a part of this Blog Hop! Your card is absolutely gorgeous! I love the colors on your background and the butterflies look amazing! Love your beautiful card my friend!! Hi, Anne! WOWOW! Your amazing colors are brilliant! Thanks for explaining how you made those lovely backgrounds! Never would I have considered using watercolor inks or any type on photographic papers! 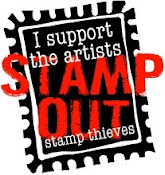 Thanks for the tip - the stamps add even more interest! I especially love your layered butterfly - fantastic design idea! And of course, how could we survive without the glitter! I will be phoning to ask how you changed the color of the sentiment - you use Word, right? It's something we talked about teaching me before LOL Thanks again for sharing the creative process and using my little stamp set! Leaving you with wishes for a wonderful day. This is gorgeous, your coloring is fabulous! Thanks for the education on Turners Syndrome. Gorgeous! And your sentiment is perfect - thanks for using your art to bring awareness to this syndrome! Great background Anne. Thanks for the explanation on how you did it! I especially love your popped up butterflies. Super design. I love using digital paper - it makes creating bright and colorful cards so easy! Sweet card --- love those butterflies! Ok Anne, another one of your techniques, that I must learn asap. This is so pretty. In love with the Butterfly. Anne this is beyond stunning!! I absolutely love it...and of course the glitter makes it sparkle beautifully!! beautiful card - love how you incorporated these TS colors!! Such a lovely card for a great cause .. love it . I love the grunge feel of this and yet it's still quite feminine. The butterfly over the ribbon is really awesome & pretty. Love your card! I like the colors of this card. I love that blue! GORGEOUS coloring and design! Thank you for bringing awareness to this syndrome and support for those afflicted! Beautiful designs using the colors for the challenge. I so appreciate seeing the names os so many Scrapyland buddies supporting Lori on her journey to make people aware of this disease. I love your beautiful card for the TS-bloghop! Pretty cards (love how you used the Nuvo turquoise glitter to edge your butterflies). Thanks for sharing your work for such a good cause. Gorgeous card, that butterfly looks fantastic, never used digital images, if they look as good as these in missing out. Thank you for the introduction to digital images & being part of this caring hop. What an inspiring card...beautiful in every way. So very like these brave girls and women with TS! Your background and butterflies are just beautiful. Beautiful colors!! Stunning card & beautiful sentiment! love the colors and style on this one! Gorgeous card I love the butterflies. so artsy, Thanks for sharing your inspiration with us. Lovely colors on your beautiful card! The butterfly is gorgeous! Those butterflies are gorgeous! They add some great dimension and the colors are so vibrant. I've never worked with digital images or digital paper before, so that's all new to me (I only have an iPad). Thanks for being a part of this hop for TS awareness! A creative and artistic card! Sucvh a wonderful hop! Love your choice of colors! Thanks! I love the pretty butterflies and your cool background for them! Beautiful card! Amazing background panels and such a lovely design. I love the beautiful colors you used. I would never have thought to use photo paper. I will have to give it a try. Thanks for sharing. The card is gorgeous. 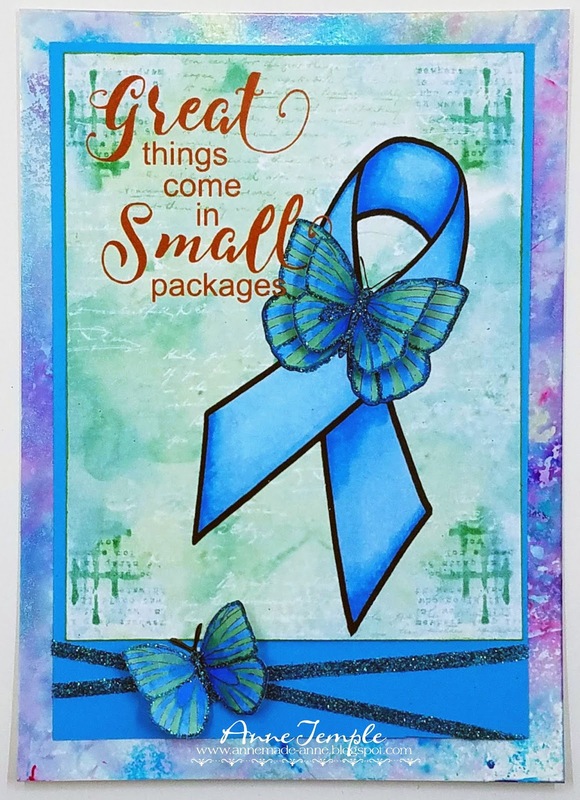 This is amazingly beautiful and the colors and the sentiment are perfect for this awareness hop. What a gorgeous card!!! Amazing colouring!!! What a pretty card. I love the background and the dimension of your fussy cut butterflies. Your card is so beautiful! I love the colors in the background and those adorable butterflies! Ooooooh....I love the intense blue!!! Wonderful use of Donna's image. Looks fabulous with your beautiful background!! I can see why you went a tiny bit crazy and made a bunch of them....I love having stacks of backgrounds ready to play with!! I love this card! That big blue ribbon really grabs your eye! Thanks so much for being a part of this hop today! Very pretty. I like the digital images you used. Very beautiful card. Love the colours. Just love the colours!! I appreciate this blog hop. My unborn great neice has been diagnosed with Turner Syndrome. Thanks so much for this blog hop! The card is beautiful and so are the words very touching.Thank you for taking part in the Inaugural Turner Syndrome Blog Hop to make us aware that such a condition exists among girls. Thank you for encouraging these butterflies to fly. May you be blessed with gd health and happiness always. Hugs and loads of love from Sri Lanka. Such beautiful shades of blue, green and purple! Thank you, Anne, for taking part in this wonderful blog hop and sharing your creativity! This is so beautiful and I think unique. I love it!